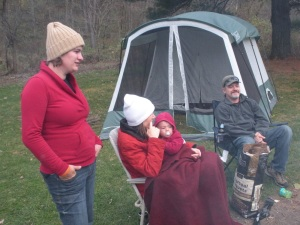 Camping can be a wonderfully rewarding, enjoyable, character-building activity for kids. It can also be one heck of a challenge! Taking children out into the woods away from their PlayStation and Wii while insisting they leave their handheld PSP behind already puts you in quite the hole in terms of helping them have a good time and keeping them entertained. Thankfully, as you and I both know, once they get out there and brighten up their attitude, they'll see that camping can actually be quite fun! Here are some ways to help make camping rewarding and enjoyable for your kids and their friends. 1. Build enthusiasm about the trip by including them as part of the planning. Take them to the grocery store so they can choose what snacks to bring and what games to play. 2. Make them have some modicum of responsibility during your camping excursion. Even if it's something as simple as helping set up the tent or collect firewood. Give them some type of task that will help them feel like they're a contributing hand in making the camping a success. Reassure them that there will be plenty of time for fun and games but that before you can do that, a little work must be done. This work-reward pattern is something many kids in this generation miss out on which is a shame because it's very character building. You can make the camp chores fun by having awards for most sticks collected, fastest clean-up, etc. With any competitive event, be mindful of everyone and keep it fun for all. Winners should not be praised too much nor losers chastized. After all, it's just camping! 4. Use your time out in nature to instill valuable skills with your kids. Teach them about fire safetey. Show them poisonous leaves so they know what to avoid. 5. When in doubt, have fun! I think you could agree that some of the best memories you form as a child take place while camping, so have a blast!